Over the past month, I have been teaching a class on Journal Writing and Nature Drawing and in many ways it has been a new experience for me. I have been painting landscapes for almost 20 years and have spent so much time observing the land, sea and sky. They have become such a part of my interior space that I almost paint from a very intuitive part of myself allowing the landscape to so penetrate my being that there is an inherent unity between myself and the outer world. My whole sense of being merges with the visual expression being sought. But on the other hand, I have spent very little time drawing or painting smaller specific elements that exist within the landscape. 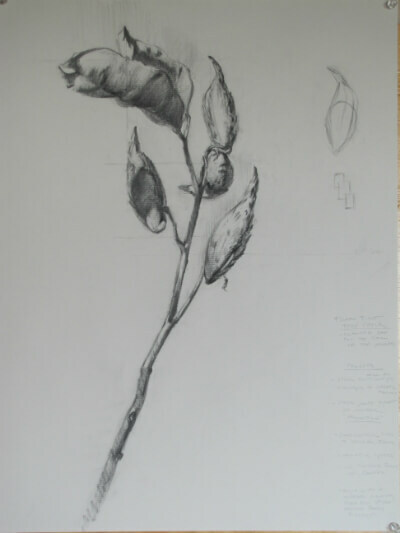 I have painted numerous fields but have not studied the milkweed plant up close. 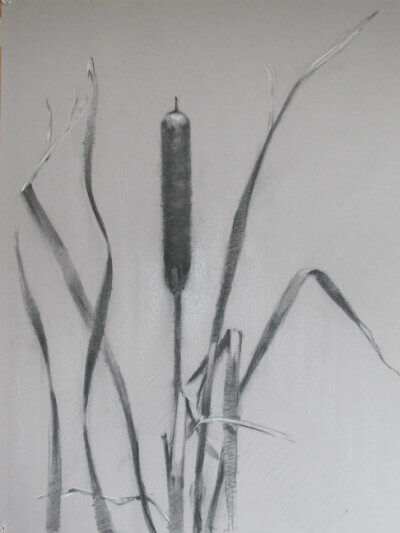 I have painted many marshes and ponds but have not specifically studied the cattail plant. Over the past couple of weeks, I have been foraging for specimens for my students to study- sumac flowers, ash branches with seeds still attached, bamboo stalks, seed pods, rose hips, abandoned bird’s nests, unhatched eggs and a wooly bear caterpillar crawling on a willow branch. It has made me pay attention to this very specific time in the fall when the growing season has ended long ago – the birds are on there way south and the plants are in the process of dying back to let their seeds go before the onset of snow. Although I have set these things up in the studio for the students to study up close, they all tell a story of their “living” quality even though they are now in a static state. I especially like the catbird nest that I found in my forsythia bush. This cat bird has returned to my yard ever since I moved to my present house. She has built may nests- one in the ash tree another in the apple and for the last 2 years in the forsythia bush. The one from this year was especially beautiful. She used the forsythia as a base, added the stems from maple leaves and finished up with some pine branches and apple leaves. Really a work of art. I can imagine her sitting aloft on such a vessel in the brisk wind. She is a metaphor for the artist who navigates the world riding upon the crafted image. I find it important to convey this attitude of “wonder” that exists in all things. It is easy to disregard this arrangement of sticks as just another ordinary phenomena. But “awe” and “wonder” must be the attitude of the artist and “praise” his task. Without this platform in which to create, the artist cannot present the world with the “new” and “vital”. We all yearn for the good, the true and the beautiful. Art can present these things in such a way that we feel the power and grandeur of existence in an immediate way. We let go of a rational explanation of the world and embrace “being” as it is. Already my students have said, “I didn’t know it really looked this way” and I hope they never stop really looking so one day the blinders may fall away and they may come to really “see” with vitality and present their singular vision- a healing vision for a blind world.